Karmaburn.com » Mahou Shoujo Nante Mou Ii Desukara. Archive for Mahou Shoujo Nante Mou Ii Desukara..
Who's ready for more BBK/BRNK faces? There are a surprising number of shows I'm interested in scheduled for autumn 2016. Most of these are sequels of some sort, but there are a few new properties that have caught my eye. Notably, I've yet to do any concerted investigating into the upcoming season, so the following only include titles that I noticed at some point and deemed worthy of preemptively annotating in my anime spreadsheet. 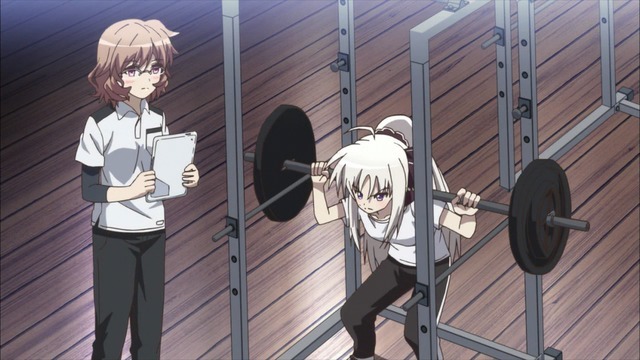 You can tell this is a flashback because Rinne has barely any weight on that thing. I'm following five mahou shoujo anime this season. Arguably, I'm following six if you include Brave Witches, but I'm not counting that one here. Surprisingly, ViVid Strike! is comfortably on top of these five, with Mahou Shoujo Ikusei Keikaku (Magical Girl Raising Project) second, and Mahou Tsukai Pretty Cure! (Maho Girls Precure!) bringing up the rear. At least that's how the ranking looks if you count separately the two shorts: Mahou Shoujo Nante Mouiidesukara. Second Season and Nazotokine.